Get Your Own domain for Free in simple Steps..
Get Your Own domain in simple Steps..
Hey guys Today while surfing on Internet I got a new and great things..
you all wants your own domain for your site/ Blogs ?? 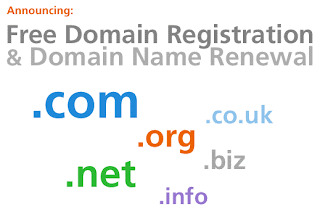 but dont want to pay..
Dont worry I am Here to you to give the free domain.. just you need a 1 account and to to signup for account by given reffral link..... " http://freedomainfactory.com/?join=336668 "
I have given My refral because.. If you signup from my ref. then you get 10 points directly..
which make you to, to get your domain..
For your Own domain.. you have to make some points and its too easy to make..
You need 50 points.. for your own domain.. But remember what I have said you will get 10 points in starting only, just create your account by my refral..
Sign Up through this link. : " http://freedomainfactory.com/?join=336668 "
Just Follows the simple Steps..
2) validate your mail account. 3) follow the steps thats is written in your home page after Sighning In there.. So guys whats you are waiting for.. go and grab your own domain..